If your jawbone is thin or soft, a bone graft procedure may be necessary. A bone graft procedure binds a durable substance to weak or deteriorated jaw bone to add strength and stability. 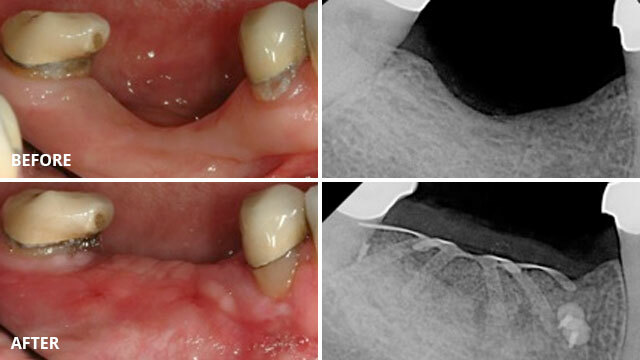 Sometimes the pattern in which the bone is lost around a tooth is such that cutting away the gums and smoothing out the bone defects is not the best treatment option, and a regenerative approach, rather that a respective approach is recommended. 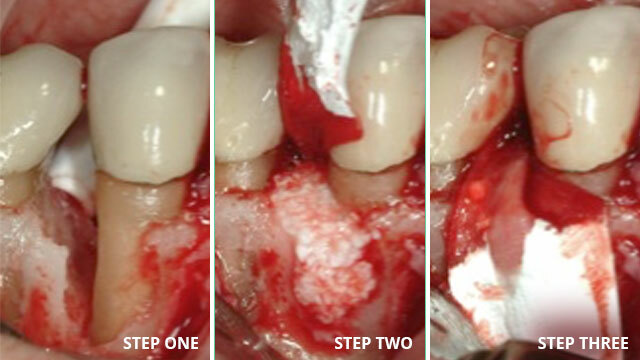 Guided Tissue Regeneration rebuild the previously lost bone and gingival tissue surrounding a tooth. Most techniques use membranes, which are place over the bone defects around the teeth. Some of these membranes dissolve away and some require removal. Other regenerative procedure involve the use of bioactive gels. This photo demonstrates bone loss around the side of a tooth. The defect was filled with bone graft and then the membrane covers over it like a blanket. Then the gum is stitched back over the bone and membrane. The x-ray beneath show before the graft where the bone is missing, and after the graft is placed. In addition, a bioactive gel called Emdogain may be used as a "fertilizer" to help the bone heal against the tooth and rebuild the lost tissue which do not easily form on their own. Bone is also lost when the teeth are lost or removed, as shown in the diagram below. Guided Bone Regenation can be used in these area to prepare the site foe a tooth-like restoration such as an implant. Sometimes grafts are done at the time of tooth extraction, and sometimes they are performed at a later visit, depending on your situation. In the photographs below, the patient had been missing her teeth for many years. The bone slowly resorbed away. A bone graft was done, and covered with a titanium reinforced membrane and tacked into place. The membrane stays in place to help the bone to heal separate from the gum. It is removed after 6 months of healing when the implants will be placed. The maxillary sinsues ae behind the check bone and on top of the upper teeth. They are larrge, empty spaces lined with a membrane of tissue. Some of the roots of the upper teeth naturally extend into the maxillary sinuses. When these upper teeth are removed, there is often just a thin wall of bone seperating the maxillary sinus and the mouth. Dental implants need bone to hold them in place. When the sinus wall is very thin, it is impossible to place dental implants in this bone. The solution is a graft to lift the sinus membrane away from the tip of the dental implant to be placed in the area. The surgeon enters the sinus from the side where the upper teeth used to be. The sinus membrane is then lifted upward and donor bone is inserted under the membrane. Often, the implant can be placed at the same time. 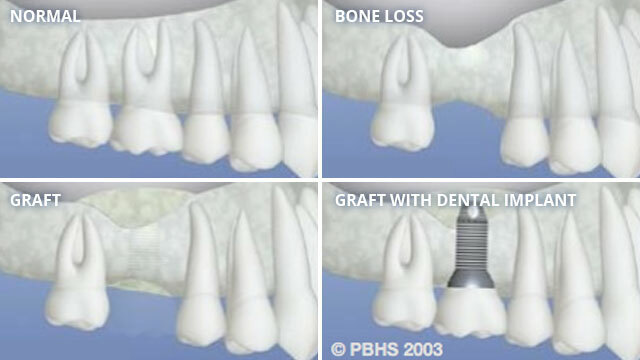 If there is too little natural bone to stabilize an implant at the time of grafting surgery, the graft is allowed to heal at least 6 months before attempting to place the implant. After several months of healing, the grafted bone become part of the patient's own bone and the dental implants can then be placed into the new sinus bone. The sinus graft makes it possible for many patients to have dental implants when years ago there was no other option. This image demonstrates bone loss around the side of a tooth. The defect was filled with bone graft and then the membrane covers over it like a blanket. Then the gum is stitched back over the bone and membrane. The x-ray beneath show before the graft where the bone is missing, and after the graft is placed. When teeth are extracted, the body works quickly to heal itself. Gingival tissue heals faster than bone, and sometimes the soft tissue fills the socket before the bone does and leaves a bone deficiency. Occasionally, because of the amount of bone loss around the tooth already, preventing further bone loss at the time of tooth removal is advantageous. Through the use of resorbable membrane, and sometimes the addition of bone, it is possible to keep the gingival tissue out of the socket to allow the bone to fill in instead. This will allow a proper bony foundation for future implant placement. It is usually necessary to allow at least 3 months for healing of the socket before an implant can be placed in the area. When implants are placed at the same time a tooth is extracted, the socket is usually always bigger than the implant diameter used to replace the tooth. 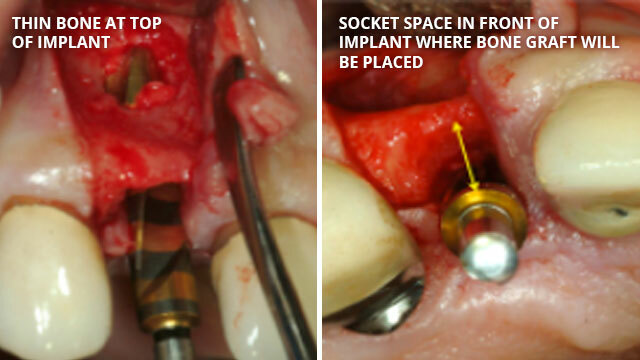 This means that there is a gap between the implant and the socket walls. Bone naturally shrinks when there are spaces to shrink into. In order to prevent this shrinkage, and maximize the natural appearance of the gum that the implant crown emerges from, bone grafting is nearly always done at the time of extraction, and often done at the time of implant placement even if the extraction was done earlier since bone shrinks after the extraction. The image below are of areas where the bone is thin, and where the socket is wider than the implant diameter to be placed.